The Portman family's estate in Marylebone in the C18th comprised 200 acres of meadowland that had been passed down from a Tudor ancestor. 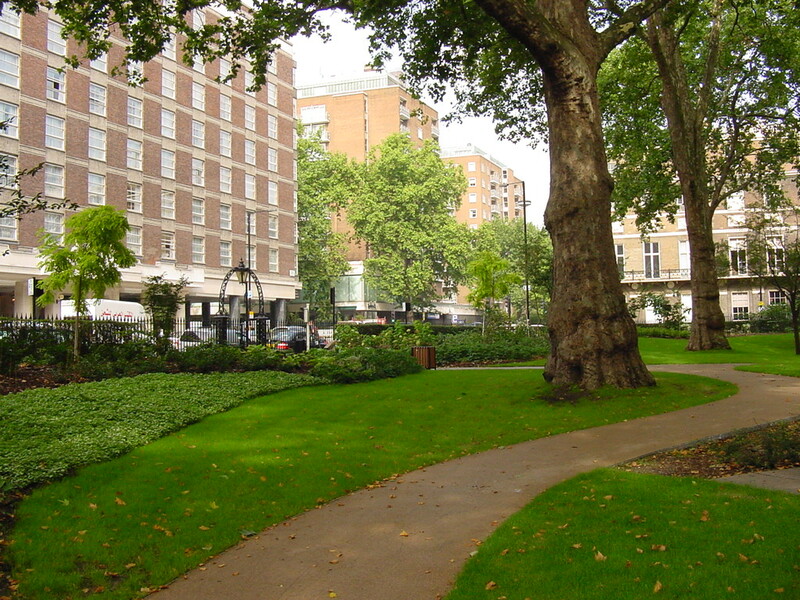 When Henry William Portman began to develop his land from 1764, Portman Square was the first square to be built, acting as the centrepiece of the new development. The garden enclosure was laid out c.1780 as a Wilderness and in the C19th had a movable temple erected by the Turkish ambassador, which enabled him to enjoy the seasons. It remains a private garden for residents of Portman Square, surrounded by privet hedge and containing fine London plane and other trees and shrubs. A major renovation of the gardens was undertaken in 2005. LBI: Nos. 20 and 21 on the north side. LBII: No. 19 on the north side; Hamilton Memorial Drinking Fountain. Portman Square was built for Henry William Portman as the centrepiece of the family's development of their Marylebone Estate on what was then the outskirts of the city. The land had been owned by the family since the C16th. The houses on Portman Square were mostly built by 1769, and completed by c.1784. Each May Day in the 1780s one of the residents of the square, Mrs Elizabeth Montagu, gave a dinner for chimney sweeps and their apprentices; Montagu Square (q.v.) is named after her. The garden was laid out by 1780. Original building agreements and leases made provision for rents to cover the cost of 'lighting, painting and repairing that part of the said Square which was heretofore inclosed with iron rails'. The income, however, was insufficient to enable it 'to be laid out as a Garden or Pleasure Ground' so a new constitution was established by a private Act of Parliament of 1780 (anno regni Georgii III Regis vicesimo secundo): 'it would be of great Benefit and Convenience to the Inhabitants of the said Square, if the Ground so inclosed as aforesaid was laid out with proper Walks and otherwise embellished as a Pleasure Ground for the use of the Inhabitants, and a more effectual Provision made for preventing Nuisances and Annoyances therein'. The inhabitants of the square were appointed trustees and vested with the upkeep: a rate was levied by them. A further Act in 1823 (anno quatro Georgii IV Regis, Cap. iv.) supplemented the powers and provisions: a pump was installed and an iron roller purchased! A `Wilderness' was laid out in the later C18th in the centre of the garden but has now gone, likewise a Turkish `kiosk', which was erected in the early C19th by the Turkish ambassador and enabled him to enjoy the seasons. Railings and gates were erected in 1882-86, but the railings were removed in 1942, later restored in 1972. In 1805, a lace hat was ordered for the gardener, to give some authority, to enable him to keep out improper persons, many having acquired false keys. There are frequent references to the necessity of protecting against vandalism by mobs and children, and of preventing damage to plants caused by playing of cricket and tennis. Until the installation of hydrants in 1889, the problem of adequate water provision was a constant problem. The polished pink granite Hamilton Memorial Drinking Fountain (1878) was donated by Lady Hamilton through the Metropolitan Drinking Fountain and Cattle Trough Association. Some of the London plane trees date from the 1780s, but the general layout was changed completely some time between 1894 and 1914 when the symmetry of the perimeter paths, as well as the beds interconnected with subsidiary paths, was removed. By the mid 1990s the shrubs were mostly outgrown and the condition of the grass was poor, affected by shade and lack of moisture due to the mature trees and tall surrounding buildings, the tennis court taking up a large section of the garden and, with the brightly coloured play equipment, somewhat obtrusive, destroying the `spirit of the place'. It remains a private garden for residents of Portman Square. The oval railed area of the garden is surrounded by hedge of clipped privet and enclosed by the road of Portman Square, related to Gloucester Place on the west, to Baker Street on the east and to Wigmore Street on the south side. There are winding paths between the entrance gates and across the central lawn. The garden has notable mature planes, grown over varied trees and shrubs that include ailanthus, laburnum, lilac, malus, philadelphus. A larger area of trees and shrubs is found in the south centre of the garden, with a shelter on the north side and a tennis court in the west centre. Restoration works have taken place in the garden in the early C21st. E. Cecil, 'London Parks and Gardens', 1907 p.222; E Beresford Chancellor, 'The History of the Squares of London', 1907 p. 262-275; D V H Eyre, 'The Garden Enclosures of Squares in the City of Westminster: Past, Present & Future', (1995, unpublished); Bridget Cherry and Nikolaus Pevsner, The Buildings of England London 3: North West, (Penguin, 1999 ed).